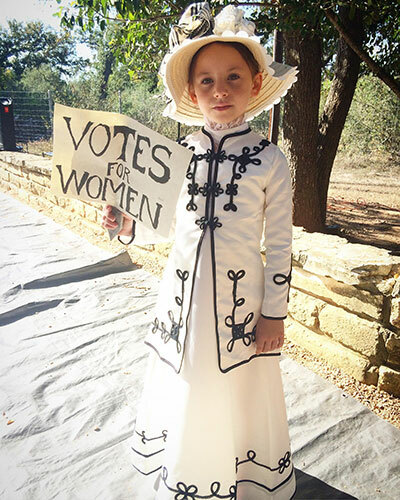 A photo collection of Mighty Girls honoring the women who fought for our right to vote. 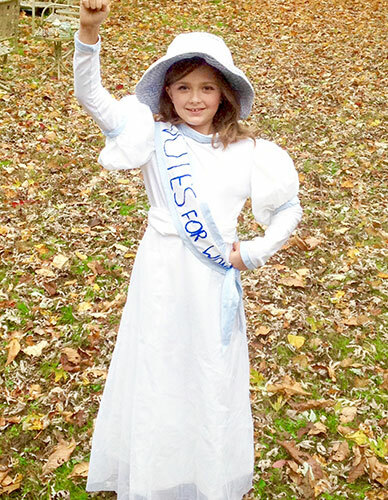 On Halloween, many Mighty Girls took the opportunity to honor their heroes — and encourage adults to exercise their hard-earned right to vote this Election Day! 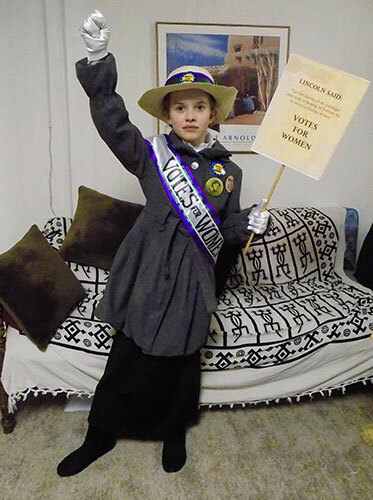 These Mighty Girls dressed up as suffragists, or suffragettes as they were often called in Britain, paying tribute to the bold women who fought for women's right to vote. In America, the fight for the vote lasted for over 70 years, and countless women struggled, protested, and were imprisoned for the cause. 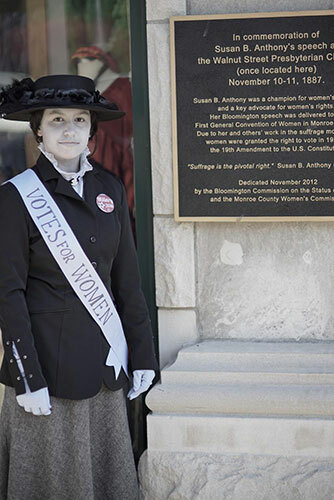 As suffrage leader Lucy Burns, who served more jail tail than any other American suffragist, once observed: "I think we have done all this for women, and we have sacrificed everything we possessed for them, and now let them fight for it now." As these Mighty Girls remind us, now is the time to honor their sacrifice and cast your ballot on Election Day. After all, while these girls are honoring the past struggle, full of all the blood, sweat, and tears it took to win the vote, they also represent our future. We vote not just for us, but for them: to create a more just and peaceful world in which they have hope and opportunity, and where their passions and talents can find expression wherever their dreams take them. 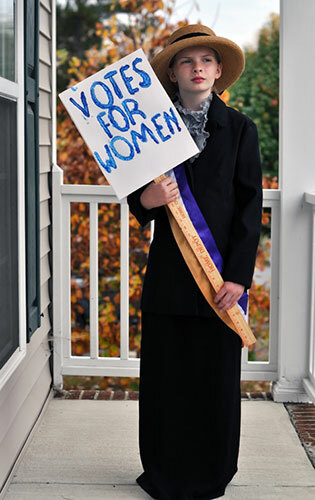 "Maya, age 10, dressed as a suffragist from the early 20th century and even researched authentic protest signs! One Halloween in School the other kids didn't know what her costume was so her teacher asked her to give a quick lesson to the rest of the class! " 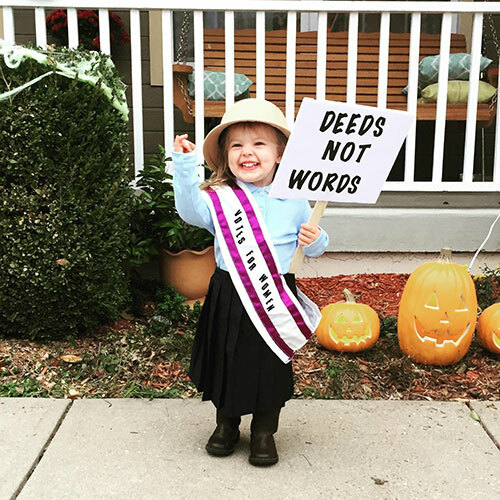 "Two year old Marylou reminds us of our privilege and responsibility to participate in our most basic level of civic engagement, voting. Vote every opportunity you get, especially in local elections. " "Sabine's great-great aunts were suffragettes. 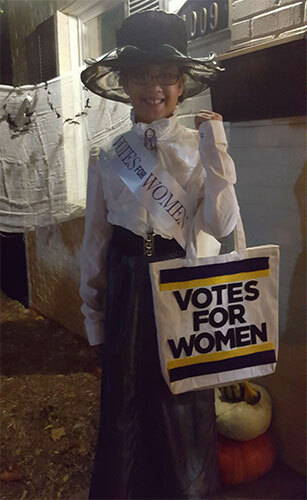 When we showed her Mary Poppins, and explained Mrs. Banks was a suffragette like some of great-granddad's sisters, nothing would do for Halloween but a Mrs. Banks/Suffragette costume. (Thanks to Grandmom for the sewing skills!) 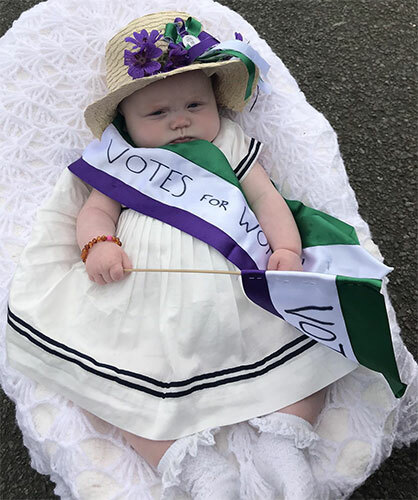 "
Four month old Fern dressed as a suffragette to celebrate 100 years of the first women gaining the right to vote in Britain. "Ella has spent the last year making her voice heard. After a boy told her girls shouldn't vote, she became even more vocal. 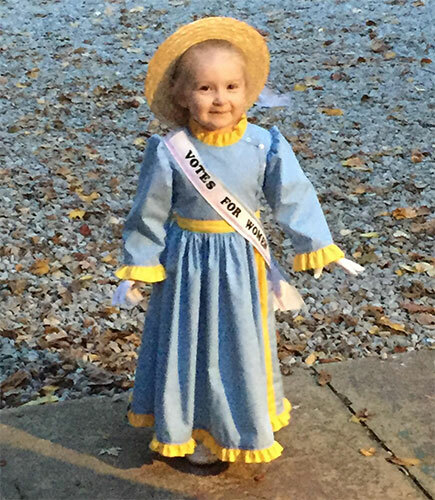 For Halloween, she wanted to celebrate woman's suffrage!" 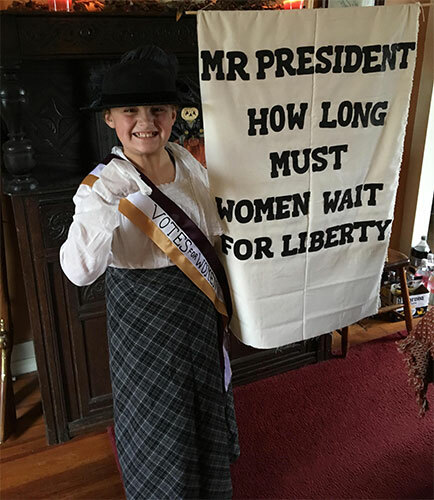 "When a co-worker friend of mine gave me her own daughter's hand-me-down costume, I took the opportunity to teach my own Mighty Girl, Esther, age 8, about the Suffragette Movement. She was so proud to wear this and said, ""Votes for Women!' instead of ""Trick or Treat"" at every house"
"""Our daughters' daughters will adore us, and they'll sing in grateful chorus: Well done! 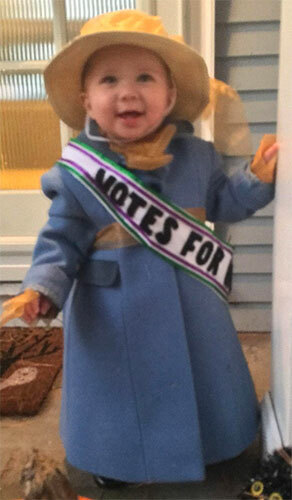 Well done, Sister Suffragette!"" 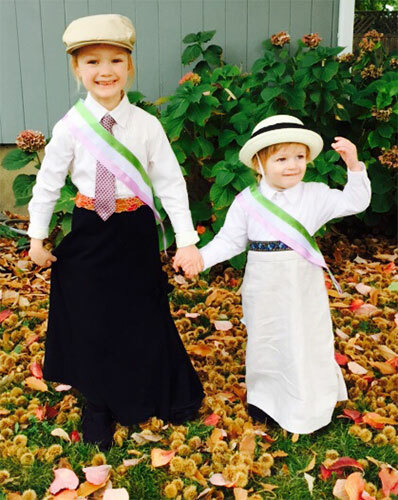 Last summer, Wendy (age 5) and Ada (age 2) fell in love with the suffragette song from Mary Poppins. Wendy's eyes became very wide the day I explained that 100 years ago, women couldn't vote in our country. 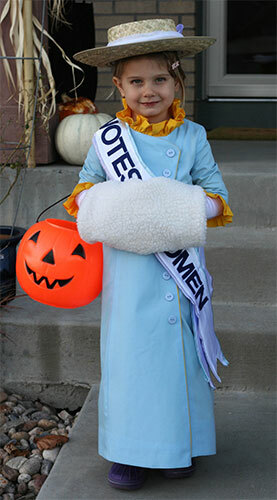 When I suggested that they could be suffragettes for Halloween, they were all in. I get a little teary to think that we actually ARE the daughters' daughters, singing ""Well done!"" to all those brave women who fought for our simple, basic right to vote." 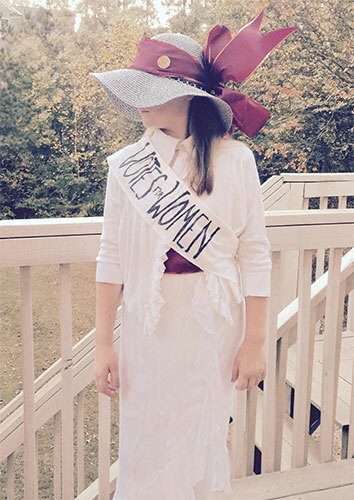 "This is my 11 year old daughter, Allie, dressed up like her hero, Alice Paul. Allie put the costume together herself with clothes found at various thrift stores and the sash she bought (with her own money!) at the centennial suffrage march in Washington, DC." "Jordan was inspired by the bravery of the suffragettes, and was proud to represent her class in student government last year. Why shouldn't girls' voices be equal to boys?! We are mighty!" 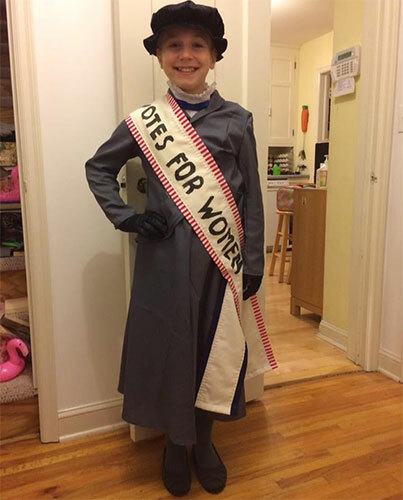 "Maria, age 10, wanted to dress up as a suffragist when she learned all these brave ladies endured just because they wanted to vote." "Laura, 12, is a true Mighty Girl. She is incensed when women are not treated fairly. She once asked why she never heard of famous women while studying history, a point for which she simply will not stand!" "Maya, 12 yo. 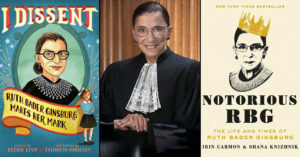 She was inspired by the thousands of real life heroes who sacrificed so much so that women can have the right to vote. " Sophia loved how this costume made her feel. 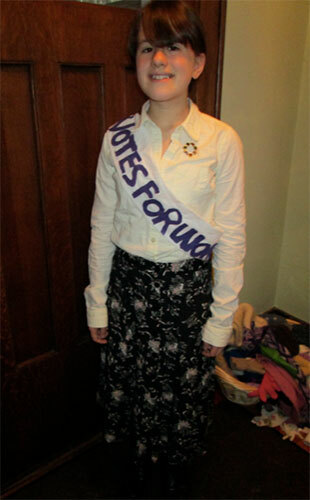 "Michaelyn, age 15, created this Women's Suffragette costume this year. She loved learning about this time in history. " "Inez, 13 months, as Winifred Banks from Mary Poppins. " "Isla, age 3. She loves and supports girl power, past and present!" 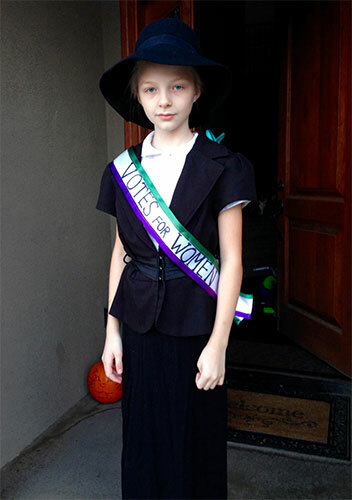 "Our 11 year old daughter spent a lot of time considering her Halloween costume and decided to be a Suffragette. She researched it and couldn't believe what women endured just to get the right to vote. She was shocked that it took 30 years for the 19th amendment to finally be passed. 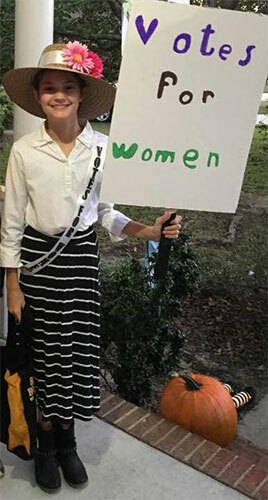 She has seen the election debates this year, heard the dehumanizing references to women as objects and wanted to be a MIGHTY GIRL and dress up like a brave suffragette. 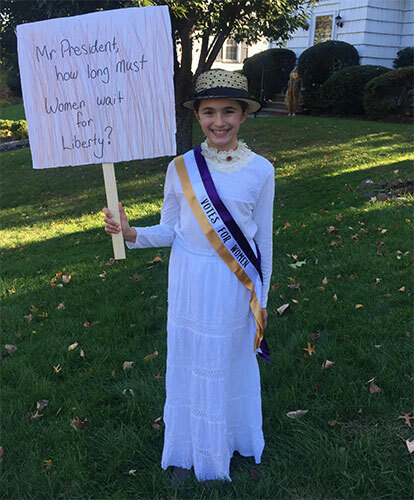 She wore the costume to school and patiently explained the story behind her costume to classmates." 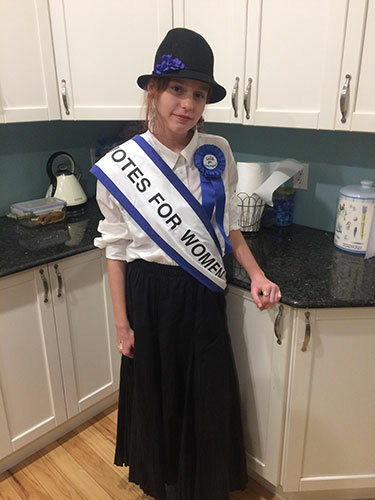 "Sage (10) was inspired by the chance to elect our first female president to dress up as suffragette, Susan B. Anthony and celebrate one of the first official votes of females." 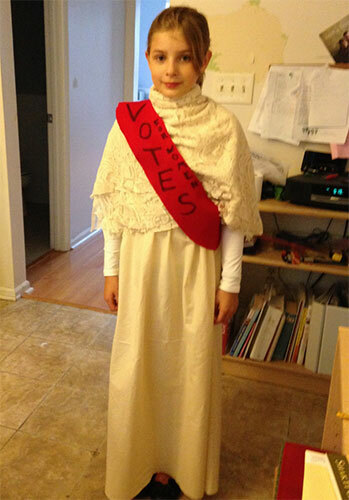 My 11yo daughter had to choose a school Halllween costume to fit the American history theme chosen by her school. 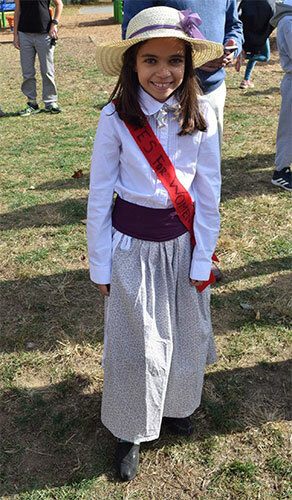 She chose to be a suffragette. 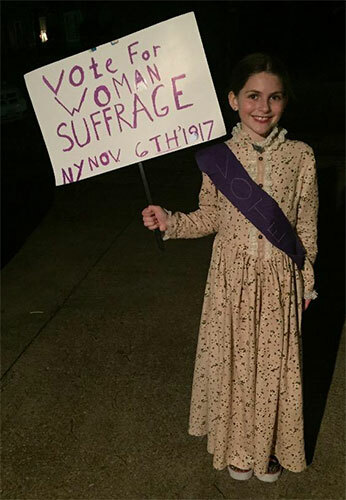 Sophie (10) thought it was a great time to remind people to vote - what better way than to remember what women went through for the right.